If you think about it, we truly owe our lives to our elderly loved one’s. Not only are we here, living and breathing, because somewhere down the line our elderly loved ones fell in love, but we have them to thank for paving the way to all the modern-day successes and technology we enjoy. Each year Older American’s Month is planned around a central theme by the Administration for Community Living (ACL). 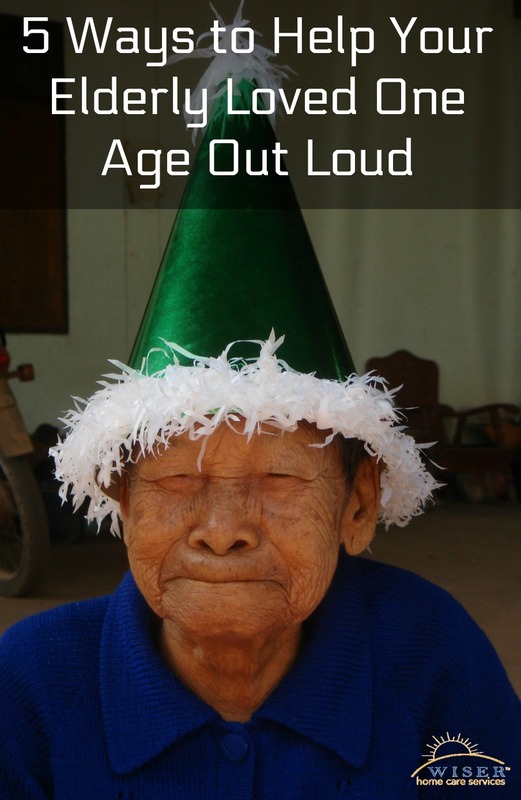 For 2017, the ACL designed the theme “Age Out Loud” which focuses on giving the aging a new voice – one that reflects what today’s older adults have to say. So, how can you celebrate Older American’s Month and help your elderly loved one “Age Out Loud”? Keep reading to learn 5 ways you can help encourage them to Age Out Loud. Our elderly loved ones have a lot of wisdom they would be more than happy to share with us if we simply took the time to ask them questions and listen to what they have to say. This will help you learn about their experiences and help them Age Out Loud. Many people have memory boxes where they store cards, pictures, letters and any other memorable items. Offer to help your elderly loved one organize their memories into a scrap book or photo album. This will give you time with them and allow them to share their memorable past moments with you. NPR has an ongoing recording project known as Story Corp in which friends, associates and loved ones can record each other during an interview or oral storytelling session. These interviews are archived for public access, and some even make it onto the weekly Story Corp broadcast. Keeping record of your elderly loved one’s life experiences for generations to come is a great way to help them age out loud and leave a lasting legacy. One way to do this is to sit down with your loved one and help them write out many of their memorable life moments. You could also share this on social media or via a blog. Even though we can’t stop getting older, we can take control of the aging process. Many older Americans are doing this by trying new careers and hobbies and taking control of their health. Help your senior Age Out Loud by recommending a potential new hobby, or maybe even a fun college course. We hope this list helps you start thinking of ways you can help your elderly loved one Age Out Loud. As always, if you would like more help, reach out to us here at Wiser Home Care Services. We can help your family establish a care plan to personally accommodate your loved one’s needs.